Apollo and I have been on the road now for over six months. During this time, I've lost track of the number of people who have said they'd like to ride out with me for the day, but their horse wouldn't be safe to ride on the road. 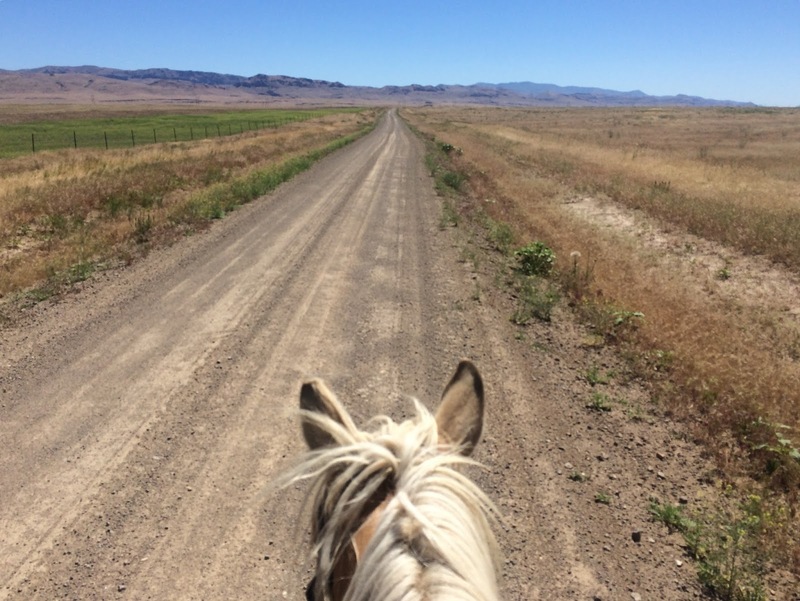 This is a smart situation in which to use such extra caution, because road riding is not at all like arena riding (although of course the same cues and lessons apply), and hardly like trail riding either from the horse's perspective. But road riding is not an unattainable goal. 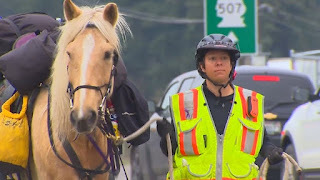 Being able to ride safely around traffic, bicycles, dogs (not barn-saavy dogs), wheelchairs, four wheelers, motorcycles, and even semi-trucks is possible, and opens up so many more options for where you can ride your horse. As a long rider, traveling along busy roads is unavoidable. 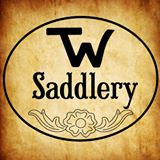 Even the Unbranded team, whose goal was to ride only in wilderness from Mexico to Canada, had a few sections of road including a frontage road along an interstate. Apollo and I are at the other end of the route-spectrum: we avoid wilderness and stick to side roads where I can find them. But there have been plenty of times I've had to ride along state highways, and even along interstate 101 in Oregon. 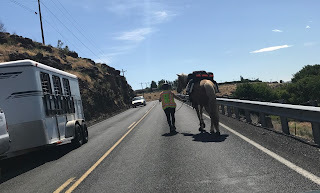 No matter how steady and quiet your horse is, if he has never seen a big rig barreling towards him at 75 mph, he will probably freak out if that's the first road experience he has. Start with gravel roads or suburban neighborhoods where there are only slow-driving cars, or better yet use divided bike paths that run alongside a road. Work up from there as your horse gets comfortable with the new sights. The faster the speed limit, the bigger the risk if something scares your horse, so keep to slow zones to begin with. Roads are full of danger, mostly in the form of vehicles. 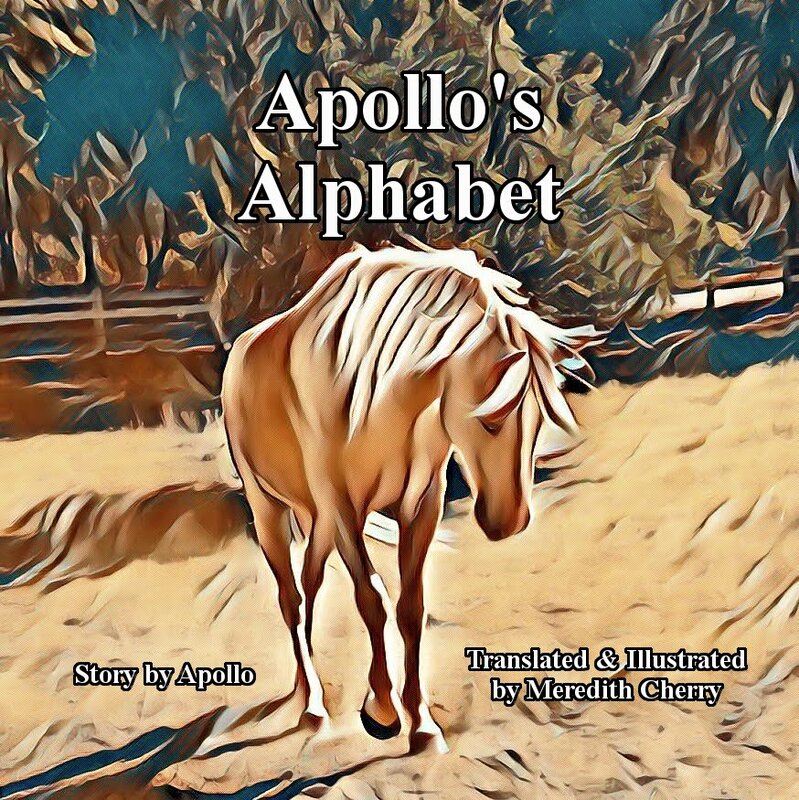 Even a pro like Apollo occasionally spooks at something on the side of the road; if he was to jump sideways as a fast moving car was approaching, it could be disastrous. Sometimes cars seem to appear out of thin air, without a sound. Quiet country lanes are no exception. Walk your horse when on the road, so that you have a better chance of seeing and hearing approaching cars. If you want to ride for speed, stick to the arena or the trail. 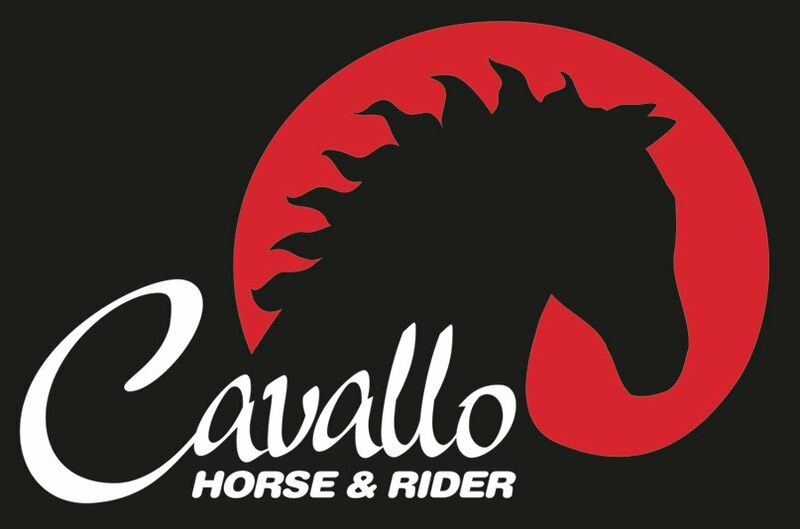 If you've ever been told that you must stay in the saddle or the horse wins, forget that idea right now. Road riding is about safety first, training first and second. 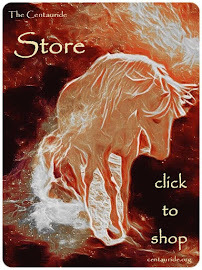 If you are approaching or in a situation where your horse is likely to bolt or to shy into traffic, or where you risk getting seriously hurt if you were to fall off (such as on a bridge, or where the shoulder is narrow), get off your horse and lead him. 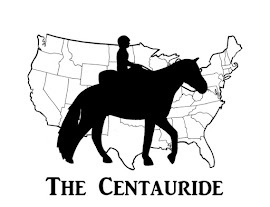 I spent the entire first week of the Centauride leading Apollo, so he could get used to all the new stuff before I put myself at risk by riding him. And it took months before I would ride him near semi-trucks. There is no shame or "losing" when you walk with your horse, if it keeps you both safe and allows him to get confidence in being on the road. 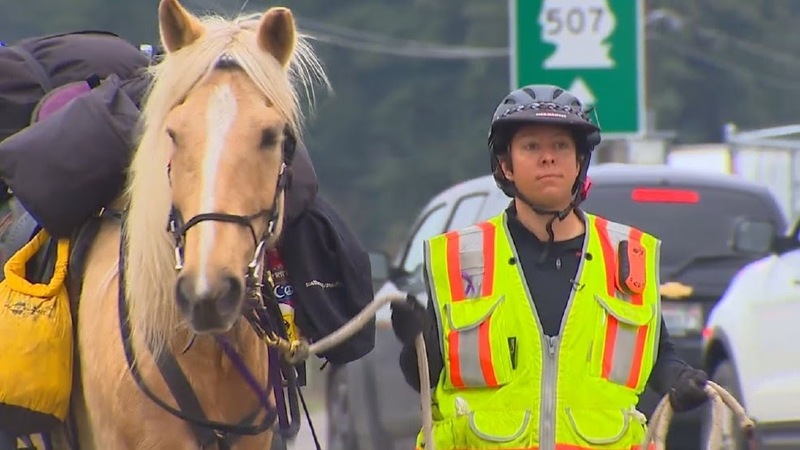 Horses are considered vehicles in most traffic codes. This means that you must ride with traffic (on the right), stop anywhere a car would, stay off the sidewalk, and otherwise respect the same traffic laws a vehicle would. The big difference is that you have the right-of-way (but NEVER assume anyone will give it to you!). And wear bright colors, reflective tape, flashing lights, etc. like cyclists, to help the distracted drivers notice you. I have heard horror stories of really foolish people (and I'm being polite here) who got hit by a car when they rode in all black at dusk. Don't be a ninja rider, stay alive. It's asking a lot of your prey-animal friend to stay calm and collected along a busy road. All those vehicles chasing him, and sometimes loose dogs too. All those new sights to get used to (flags, mailboxes, weird lawn art). People like to honk at horses, either to let the rider know they're approaching or just to say "hi!" - this too is a lot for a new road horse to handle. Apollo is a fast learner, but it took a full six months of actual road travel (plus several months of less-frequent road training rides) before I really felt that he had seen it all and was trustworthy in all but the craziest situations. Celebrate the small achievements. Remember that getting safely to the end of the road is an achievement in itself, no matter how scared or naughty your horse was along the way. I have to ask if you get the question I get most when I lead my horse along streets, "Why aren't you riding the horse?" *sigh* If I had a nickel for every time I've been asked that, I'd be wealthy. I live in a horse-friendly country, Germany, with multi-use trails and users who understand horses. But the trails simply connect the towns, so I'll always end up on a paved street again, and have to use 100KPH streets to get to the trails. My horse has become worse at dealing with big rigs this Winter for some reason, so I've got an extra long lead rope and gloves for when he tries to leap away from me. I often just stop and sit at a bus stop for him to experience the traffic blowing by his tail. I always wear a hi-viz vest now, even though I don't ride in the dark, because if it helps someone see me a moment sooner, it's worth it. 90% of the traffic slows down and passes wide, and I wave and say Danke. The 10% that don't slow down always surprise me, "Whoa, he didn't slow down at all! He must not like his car." As a former endurance rider, I admire the Long Riders.